Measuring accuracy: ± 0.2% at standard flow rate (exact value is stated in individual Calibration Certificate) and approx. ± 0.5% across the entire measuring range. The possibility of selecting the gas meter material from among 5 different excellent materials: Polyvinyl Chloride (PVC), Polypropylene (PP), Polyvinylide Fluoride (PVDF), PE-el (polyethylene electrically conductive) or refined stainless steel 1.4571 (316 Ti) enables the user individually to meet measurement requirements even in case of highly aggressive gases. For rugged, industrial applications, robust models with a stainless steel casing and plastic drum (four different materials) are available. Fastidious production methods and calibration enable a measuring accuracy of ± 0.2% at standard flow rate and approx. ± 0.5% across the entire measuring range. The direct measurement of volume is the major advantage and the superiority of volumetric gas meters (like drum-type gas meters) over other measurement principles, which determine gas volume using secondary measurable variables such as speed, heat capacity, hot-wire resistance or similar. That means that the condition and the composition of the gas do not influence the measurement accuracy. The drum-type meters need no maintenance and no power supply (unless equipped with option »Pulse Generator). RITTER Drum-type Gas Meters are specifically designed for use with corrosive gases. They are made out of a selection of 4 superior plastics (PVC, PP, PVDF and electrically-conductive PE). A gas meter can therefore be selected which is completely resistant to the corrosive gases being measured. Stainless steel is not completely resistant to corrosive gases and will be damaged by them over time. Even RITTER's Gas Meters with a stainless steel casing have a measuring drum made out of one of these high quality thermoplastics. 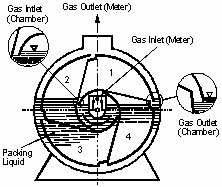 This is because the measuring drum is the most important part of the gas meter and also the most susceptible to the effects of corrosive gases. Competitor meters have a stainless steel casing and a measuring drum that is also made out of stainless steel. Because the steel plates used to make these measuring drums have to be so thin, they can only be soft soldered together. Soft solder weldings are eaten away by aggressive gases very easily! So even when the stainless steel itself is fairly resistant to corrosive gases, the soft soldering is not. This can cause the measuring drum to completely fall apart when the soft soldering is eaten away. The measuring drum parts in RITTER Gas Meters are welded together with exactly the same material that the drum is made out of. PVC drums are welded together with PVC rods; PP drums with PP rods, PVDF drums with PVDF rods and PE drums with PE rods. The welds in RITTER Gas Meters are therefore as corrosion-resistant as the material used to build the drums. 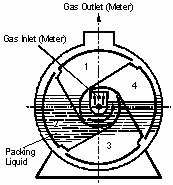 All drum-type gas meters contain a Packing Liquid - usually water. If the measuring drum is stainless steel and is used to measure a gas which reacts with water to form an acidic solution, the acidic solution can eat through the part of the measuring drum sitting under the water-line. This occurs most rapidly in gas meters which are not used very often. RITTER Gas Meters do not have this problem. Some gas meter manufacturers offer stainless steel measuring drums with epoxy coating. It is very difficult to apply the coating completely evenly on the drum surface, especially in the sharp corners of the drum (where the soft solder welds are). These are weak spots where corrosive gases can even more easily start to attack and destroy the drum material and soft solder welds. Competitor stainless steel gas meters have an axis which must go through the casing wall to connect the measuring drum to the needle indicator on the gas meter dial face. These meters have an O-ring or similar to seal the hole in the casing where the axis goes through. This O-Ring is under the packing liquid level. Because of the mechanical friction of the axis turning in the O-Ring, the O-Ring eventually begins to wear out. 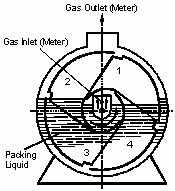 If a gas has reacted with the packing liquid and turned it acidic, this acidic solution also begins to eat into the O-Ring material. Sooner or later the O-ring starts leaking. This causes the level of the packing liquid to drop. This drop in packing liquid level causes the gas meter to measure inaccurately. At first, when leakage is small, the drop in packing liquid level may not be realised by the user, so he/she does not realise that the measurement is wrong. If this leak becomes greater, the acidic packing liquid which leaks into the counter mechanism casing can damage the parts there. RITTER uses a magnetic coupling system to connect the measuring drum to the needle indicator on the gas meter dial face. This means that there is no hole in the casing wall, and no O-Ring. The casing wall remains solid, and so there is no possibility of packing liquid leaking out. The gas meter remains gas and liquid-tight for its lifetime. 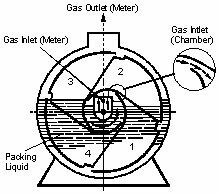 If dirty gases are measured, the rotation of a drum-type gas meter measuring drum acts like a washing machine and forces the »dirt« out of the gas. This sediment builds up on the bottom of the gas meter casing. If it builds up too much it can hit the measuring drum, either slowing it down or making it stop altogether. If it slows it down, the measuring accuracy is affected without the user knowing. If it stops the rotation of the drum, it ruins that test run completely. With stainless steel gas meters, the user cannot check how much sediment has built up on the bottom of the gas meter casing and so does not know if the test runs are being affected. RITTER PVC Gas Meters have a transparent casing, which means that this sediment build-up can be very easily monitored. The gas meter can be taken off-line before the sediment build-up can affect measurement accuracy or ruin test runs. It can then be cleaned between runs. If a stainless steel gas meter has been epoxy-coated, it is very difficult, if not impossible, to repair. This is because epoxy-coated parts cannot be re-welded. Because of this, some stainless steel gas meter manufacturers refuse to repair these meters. When they do repair, these repairs can be very expensive. This is because undamaged epoxy-coated parts have to sometimes be removed to get to the damaged parts in the meter. Because the undamaged epoxy-coated parts cannot be re-welded, they have to be replaced along with the damaged parts. The thermoplastics which RITTER uses to build gas meters can be re-welded. That means that only the truly damaged parts need to be replaced. This makes RITTER repairs economical. For chemical resistance properties please contact your RITTER distribution partner.